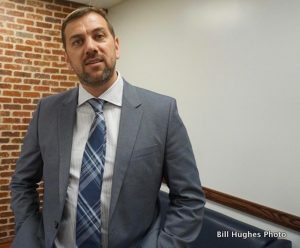 Documentary filmmaker Sean Murray spoke Wednesday at the National Press Club, in Washington, D.C. He is a native of Belfast, Northern Ireland. The event was sponsored by the Commodore John Barry Division of the AOH. William Pribyle of the Maryland AOH helped to coordinate the program. Murray’s film deals with government collusion with the Loyalist deaths squads in the British-occupied north of Ireland, prior to the signing of the “Good Friday Agreement.” It is based on the best-selling book, “Lethal Allies: British Collusion in Ireland” by Anne Cadwallader. The Glenanne Gang killed at least 120 victims between “July, 1972 to the end of 1978.” To learn more, go to the website. Murray shared briefly some of his views with me about his new film. Sean Murray On his Film: “Unquiet Graves” from Bill Hughes on Vimeo.